Location: The Property is located on the south side of King street approximately ¾ miles west of Hammersmith Broadway. The front elevation facing King Street is assumed to face due north. The building is not Listed but within St Peter’s and Aposos Square conservation area. The Property comprises an office building with two retail units occupying part of the ground floor. The building is on a corner plot at the junction of King Street and St Peter’s Square and the main office entrance is on the corner of the Property, where these two streets intersect. The building has a ground and three upper floors, but no basement. It is L-shape in plan with a north wing facing King Street and the south wing facing St Peter Square. The building, together with the adjoining properties, enclose the Property’s car park to the rear. There are adjoining properties to the east of the building and to the south of the car park. The existing heating and cooling system comprises a four-pipe fan coil system, with a gas fired boiler system at roof level. The chilled water is provided from a chiller in the roof plant room and cooled condensers on the roof. The system also includes hot and cold-water services, toilet ventilation and fresh air supply and extract ventilation systems. ducts. The installation also includes a central battery emergency lighting system, fire detection and alarm system, isolation for mechanical plant and two lifts. 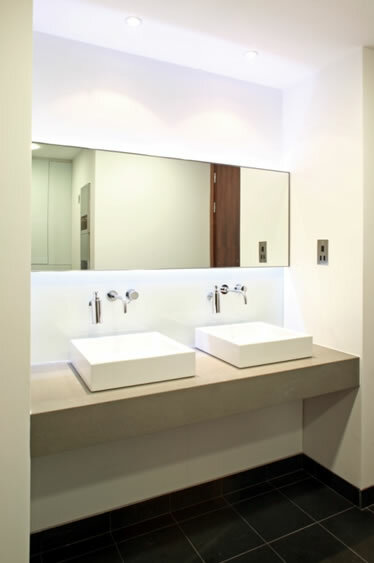 Male and female toilets are provided on each floor accessible off the lift lobbies and main entrance lobby. The various existing services are generally beyond their life expectancy and as such are not considered suitable for a further 10 years of service, although some, e.g. supply and extract ductwork risers are considered suitable for continued use. Therefore, the refurbishment works includes their replacement. 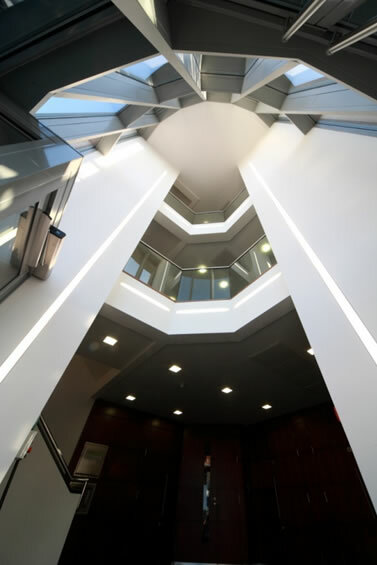 First to Third Floors – office refurbishment and fit-out to CAT A standard. Ground Floor – Entrance and Reception area refurbishment. Ground floor retail units – Strip out and leave as shell. Roof / fourth floor – modifications and phased replacement of plant room pipework and services. 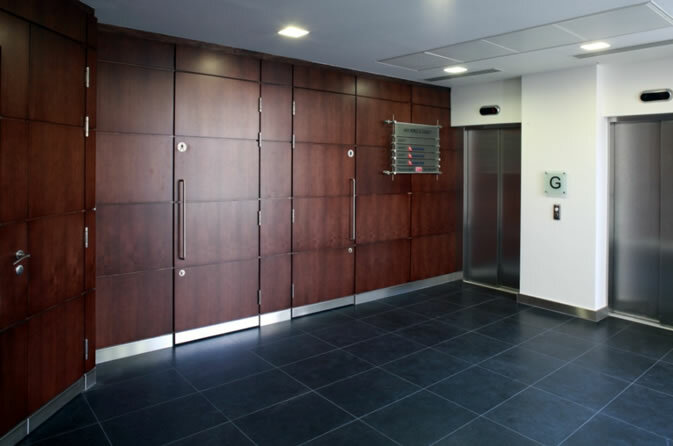 Ground to fourth Floors – Staircore and lift lobby refurbishment. 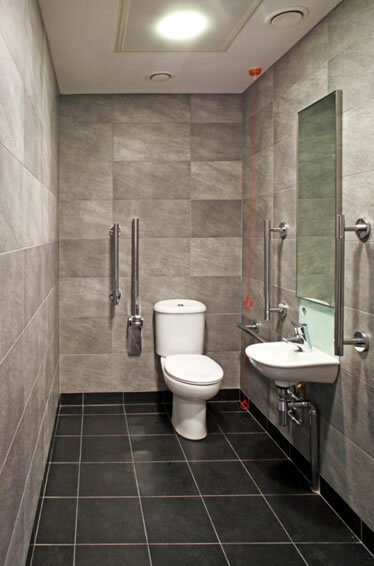 Ground to third Floors – Remodel and extend toilet facilities. CDM Designer risk assessments and competency statement in accordance with the Construction (Design and Management) Regulations 2007 shall be provided by the Contractor. With the exception of the recent ground floor fit-out undertaken by Qantas, the exact arrangement of existing services is unknown. No reliable record information exists. Detailed surveys are required by the Contractor. The Contractor shall determine for himself the extent of surveys that he considers necessary to enable him to establish the full extent of work required, the validity of all existing services information indicated by the Tender documentation and how that work will be able to be done and shall include for and undertake those surveys accordingly. No reliable commissioning data exists for the systems, therefore, the contractor shall undertake validation surveys, witnessed by the Landlord and Tenant representatives, for services to remain / be reconnected (eg ventilation air volumes to ground floor) prior to commencement. The new services within the office spaces shall be designed and installed in such a way as to minimise alterations should the space be sub-divided by a future tenant. The design scope covers base-build to British Council for Offices Guide 2005, Category A. The specification provides details of suitable equipment and materials deemed to represent the quality required by the Employer. The contractor shall provide a tender that represents these specification requirements. Although the Employer may accept alternative manufacturers, it shall be the Contractor’s responsibility to detail any alternatives separately within the Tender return documentation, together with details of cost and programme implications. Note that, where the works require addition or amendment to an existing installation, all validation, cleaning and re-commissioning of the complete systems shall be included. Prior to reconnecting to any existing building services, the contractor shall demonstrate that the new installations have been thoroughly cleaned and sterilized to avoid any possibility of contamination. and Qantas’ teams, the provision of temporary supplies and by out-of hours/weekend working. All shutdowns shall be fully planned beforehand; the Contractor shall take note of the notice periods Qantas require for certain shutdowns. Refer to the Main Contract documents for length of notice periods to be given. A plant replacement strategy has been drawn up for development by the design and build contractor to outline how the works could potentially be done without undue disruption to tenant operations (Refer to Section C10). The contractor is to take note of the notice periods Qantas require for certain shutdowns (mainly affecting IT and electrical systems); reference should be made to the Main Contract documents for further information. All necessary allowances for temporary / enabling works shall be made by the contractor to ensure systems remain in operation without undue disruption. All existing services within the areas to be refurbished shall be removed and disposed of unless it is specified that the particular service (e.g. pipework containment) can be re-used or unless otherwise identified beforehand by Qantas to be retained. Any services required by Qantas to be retained will be clearly identified by Qantas. The Contractor shall work closely with Qantas’ team to enable their services to be properly identified and for any clarification regarding the services to be retained. Refurbishment within the ground floor tenant’s demise has been undertaken/is being undertaken by others. The provision for primary ventilation services to serve the demise, is required to be provided by the Contractor as part of the building’s overall refurbishment works. All equipment and other arrangements necessary to serve the demise shall be included for and provided accordingly. The first floor tenant’s comms/computer room is to remain in-situ and operational throughout the refurbishment works. Existing services/equipment within the room are required to remain and shall not be disturbed. The primary supply and return air serving the room will remain but shall be re-fed. The existing a/c cooling units shall also remain. The existing ‘Safes’ area at the rear wing of the building on the 2nd floor shall also be retained and remain in use throughout the works. The refurbishment of this area will need to be undertaken at a suitable point in the programme and not necessarily concurrent with the rest of the 2nd floor works. The existing building is served by a 4-pipe perimeter fan coil unit system. The system comprises boilers, chillers, pump and pressurisation equipment, primary fresh air handling plant and miscellaneous services contained within a roof top plant room. Pipework and ductwork is distributed throughout the building via a network of vertical services risers and the ceiling voids. 2 No conventional flue gas-fired boilers currently provide the heating for the 4-pipe fan coil unit system, primary fresh air handling plant, central core areas heating and primary hot water services. 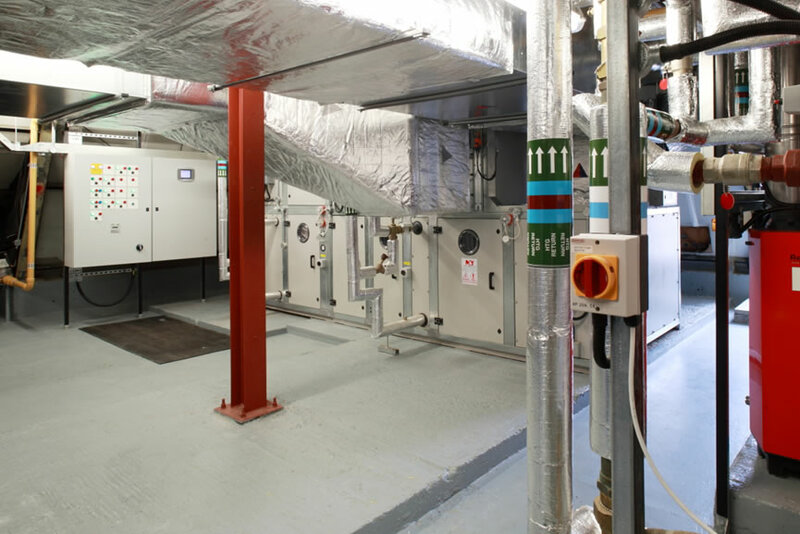 Boilers, pressurisation unit, etc are located within a boiler room which forms part of the 3rd floor roof plant room. Heating circulating pumps are located in the chiller / pump room next door. The existing chiller unit is located within the chiller / pump room and heat rejection via 2 No DX air cooled condensers located on the 3rd Floor roof. Refrigerant is R22. Primary chilled water pumps are also located within the chiller / pump room. In addition, several tenant air conditioning systems exist. The First Floor is served by an independent VRF systems with outdoor units located on the 3rd Floor roof. The 1st Floor Comms Room is served by several split type DX systems with their condensing units located on the 3rd Floor roof. The VRF systems will be replaced as part of the refurbishment works. However, the existing split systems serving the Comms Room must remain in operation throughout the works and will not be altered. Ventilation to the office areas is currently provided by a fresh air supply air handling unit located within the roof plantroom, with three supply air ductwork risers which drop through the building and distribute within the ceiling voids at each floor level. Extract air is distributed in a similar manner, drawn from the office ceiling voids and up a single extract riser adjacent to the central core. The extract fan is located in the roof plant room and discharges exhaust air to atmosphere via a roof mounted cowl. The toilet blocks are provided with supply and extract ventilation by dedicated supply and extract fans also located within the roof plant room. The supply and extract ductwork share a central toilet riser which is located between the existing male and female toilet blocks. Tenant tea point duct, drainage SVP and domestic water services pipework is also located within this enclosure. The central core stair well is heated by fan convectors located in the lobby area of each floor. Generally these are on the core wall that subtends the toilet block, except the ground floor reception where it is located on the opposite wall. The reception has additional heating by a ceiling concealed fan coil unit adjacent to the lifts. The escape stairs at each end of the building are heated by a radiator system, fed from the central boiler system. A wall mounted motor control panel is located in the main plant area, which serves the major mechanical plant. The systems are to be replaced as described in following sections, but will remain operational during the works as the building will be occupied throughout. Some of the primary services distribution will need to be retained to allow the phased refurbishment to be carried out. The existing 3rd floor roof plantroom structure shall be retained and all walls and partitions stripped out to create a single space. This will allow more efficient use of the plant space. The existing mains water supply enters the building from a main running along St Peter’s Square and serves a 54mmø meter located within the female toilet services riser. The main then rises up the building to a cold water storage tank within the 3rd floor plantroom. Cold water services are gravity fed to each existing sanitary fitting in the building. 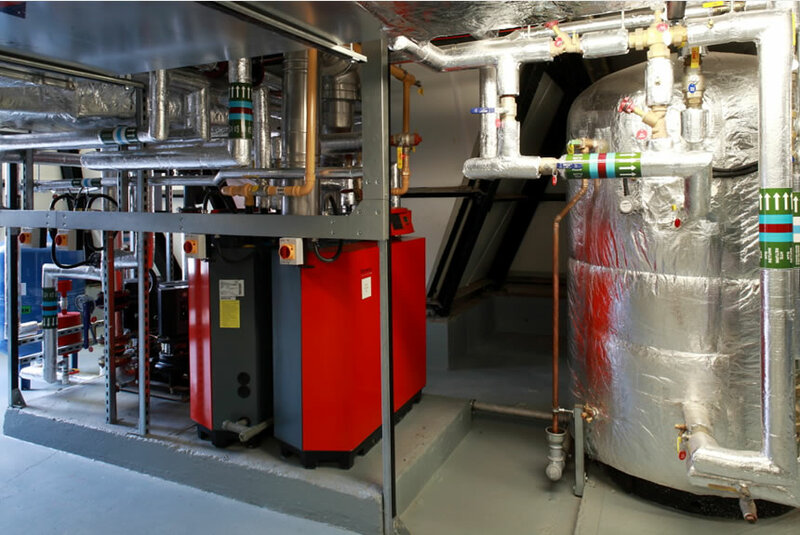 Hot water is provided by a horizontally mounted hot water calorifier, also within the roof plantroom. Primary heating to the calorifier is served by the central boiler system. An existing pumped hose reel system is served from the main storage tank. The central systems are to be replaced as described in the following sections, but will remain operational during the works as the building will be occupied throughout. The following strategy is intended to outline how the plant replacement works might be approached with minimum disruption to the tenant. This shall be developed / modified as necessary by the contractor as necessary to provide an optimum, agreed solution and all necessary inclusions made in the tender. Refer to the Main Contract Preliminaries for the overall programme / sequence of works. The Ground Floor refurbishment and fit-out will have already been completed by Qantas prior to the main works commencing. 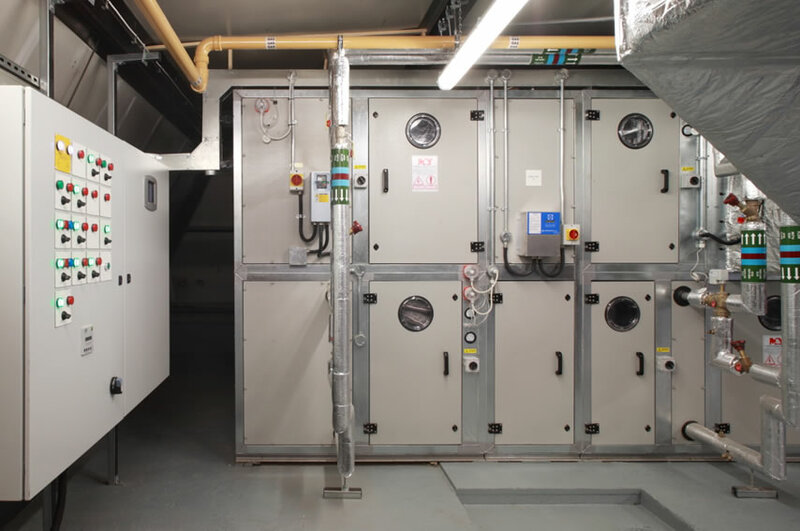 They will be connected to the central ventilation system, disconnected from the central heating and chilled water risers, and will have installed their VRV condensing units on the roof in an agreed location to coordinate with our scheme. 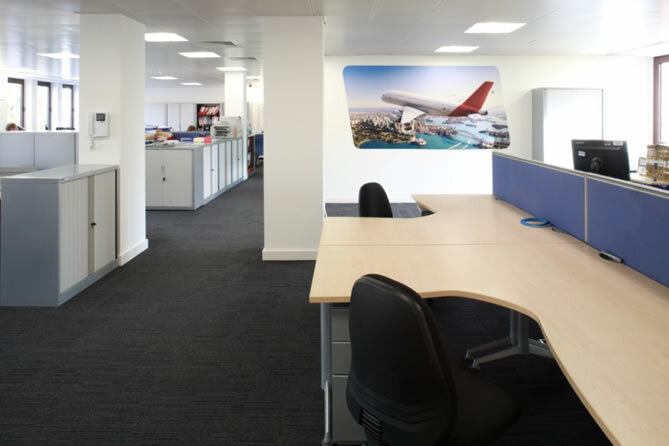 Record drawings for this recent fit-out can be made available from Quantas, with prior arrangement with the Project Manager. 1st Floor services stripped out back to risers with any necessary valve cut-ins done at night /out of hours. Note: heating and chilled water pipework in ground floor serving 1st floor perimeter fan coil units will need to be drained necessitating access to ground floor. Provide temporary (electrical) heating and mobile cooling units for local ‘hot spots’ provided to 2nd floor offices during 1st floor works (as pipework feeding floor above is within 1st floor ceiling void). Central air conditioning, heating and ventilation plant runs as normal to other floors. Ventilation risers retained throughout for reuse (these will be cleaned at the end of the refurbishment works programme). VRV condensers for Floors 1, 2 and 3 installed in permanent locations, and 1st Floor VRV system completed. (vii) New 1st Floor ventilation system re-connected to existing central system and re-balanced. Qantas fit-out 1st Floor, and vacate 2nd Floor. 2nd Floor services stripped out back to risers with any necessary valve cut-ins done at night /out of hours. Provide temporary (electrical) heating and mobile cooling units for local ‘hot spots’ provided to 3rd floor offices during 2nd floor works. Central air conditioning, heating and ventilation plant runs as normal to 3rd Floor. Ventilation risers retained throughout for reuse (these shall be cleaned at the end of the refurbishment works programme). 2nd Floor VRV system completed. New 2nd Floor ventilation system re-connected to existing central system and re-balanced. Qantas fit-out 2nd Floor and vacate 3rd Floor. 3rd Floor services stripped out. Central heating and chilled water systems de-commissioned and stripped out with the exception of the internal pipe work risers which will be drained and stripped out / abandoned. Some temporary frost protection heating may be required to the common parts. 3rd Floor VRV system completed. Strip out chiller room including chiller units, chilled water run & stand-by pumps, pressurisation unit etc and associated pipework. Retain LTHW heating pumps. Local modifications may be required to the existing heating system within the roof plant room to allow new services to be installed. Strip out redundant external main condensing units and associated pipework, etc. Build new AHU in old chiller room and install ductwork, louvres, etc. Undertake weekend connection to existing supply and return air ductwork. Local modifications and temporary connections to the existing supply and return air ductwork may be required within the roof plant room to allow new services to be installed. 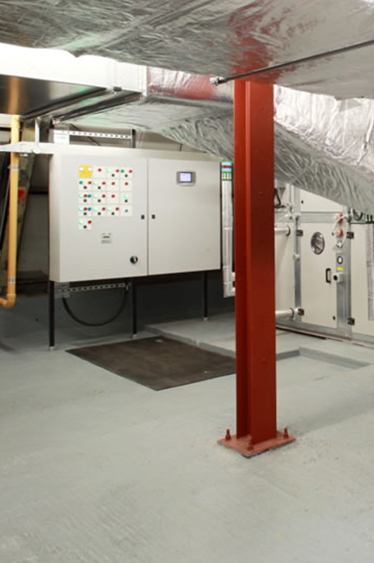 Provide new primary heating connections to new AHU from existing heating system. Install new boiler and HWS plant in old AHU location, and provide new heating pipework to serve existing circuits. Change over heating and gas connections to existing AHU, HWS and ancillary heating circuits over a weekend, and commission. Strip out redundant boilers, pressurisation unit, etc. Install temporary cold water tank in old boiler room and connect to existing CWS and HWS systems. Strip out existing cold water tank, hot water calorifier and fire hose reel pumps. Build new cold water tank, install new booster pumps and fit new hot water system. Connect into CWS and HWS plant. Commission cold water tank and booster set. Remove temporary cold water tank. Replace WC supply and extract units, louvres, local ductwork connections, etc. Replace tenant tea point extract unit, louvres, local ductwork connections, etc. Final air balance of all office floor and toilet ventilation plant to be carried out out-of-hours / weekend. The run within the Qantas comms room is to be drained but left in situ to avoid disturbing the existing space. The run within the area occupied by the safes will need to be removed at a time to suit the programme and not necessarily concurrent with the works to that floor. The Mechanical Contractor shall agree the sequence of works prior to commencing on-site and ensure maintaining of supplies and services to areas out of the works/phase areas. The whole of the mechanical and public health services within the retail units shall be stripped back to shell, except for incoming services as described elsewhere. A survey of the existing services shall be carried out prior to commencement of stripping out to ensure there are no live services running through the retail units that serve the offices. The contractor shall provide a separate cost for all works associated with the retail units. The contractor shall allow for the removal from site and disposal of ALL equipment and materials stripped out. The contractor shall allow for all necessary valves to be cut in to existing pipework branches on each floor, to allow for redundant pipework to be stripped out whilst the remaining existing systems continue to operate. All works outlined shall be programmed in such a manner as to ensure the safety of site operatives undertaking the enabling works or strip out of the building fabric. Any works that comprise the removal of redundant plant, removal of refrigerant gases, halons and other substances considered potentially harmful to health and to the environment, shall be undertaken in accordance with statutory codes. The Contractor’s attention is drawn to the likely existence of substances potentially harmful to health and to the environment within the existing installations, particularly halon gases, refrigerant and asbestos. Refer to the Main Contract documents and the Health and Safety Plan. All noisy works and works affecting the occupied demise are to be undertaken in accordance with the Preliminaries Documents. Stripping out of relevant services shall include all brackets, fixings, insulation, etc. Disposal of all materials shall be in accordance with the Waste Management Regulations and all relevant codes. All existing live services which are to be retained shall be protected during the refurbishment works.